Although pumpkins are very much part of northern European 'Halloween' culture, the plant itself is believed to have originated in North America. In fact, seeds from related plants have been found in Mexico dating back to 7000 to 5500 B.C. References to pumpkins date back many centuries, and the very name 'pumpkin' originates from the Greek word 'pepon' meaning 'large melon'. However - over time - there was an evolution in how the final name arrived, starting with the French who called it the pompon'. The English changed the name to 'Pumpion' and finally American colonists changed that into 'pumpkin' which has so far remained unchanged. It was the native American Indians who first used the pumpkin as a food crop but they had other uses for it too. Not only did they dry strips of pumpkin for weaving into mats, they also invented a form of 'fast food' by roasting long strips of pumpkin on open fires. When the first white settlers arrived, they witnessed this versatile plant and it soon became part of their diets too. They used them in a wide variety of recipes from desserts to stews and soups, although the origin of pumpkin pie is thought to have come from the practice of early colonists who cooked de-seeded pumpkins filled with milk, spices and honey on the hot ashes of a dying fire. The carved pumpkin used to ward off evil spirits comes from the centuries old tradition of the Halloween 'Jack O'Lantern'. The practice comes from Ireland and originates from an old Irish myth about a man nicknamed 'Stingy Jack'. According to the story, Stingy Jack invited the Devil to have a drink with him, and true to his name Stingy Jack didn't want to pay. Somehow, he managed to convince the Devil to turn himself into a coin so that Jack could use it to buy his round. However, as soon as the Devil did so, Jack decided to keep the money for himself and put it into his pocket next to a silver crucifix. This had the effect of preventing the Devil from changing back into his original form. Jack eventually freed the Devil, but he imposed several conditions beforehand. The first was that the devil would not bother Jack for one year and that - should Jack die - he would not be able to claim his soul. The Devil agreed and Jack let him go. The following year, Jack tricked the Devil again, fooling him into climbing into a tree to pick a piece of fruit. While he was up in the tree, Jack carved a sign of the cross into the tree's bark so that the Devil was unable to make his way back down again. Once again the Devil had to remain there until he promised Jack that he would not to bother him for a further ten years. Soon after, Jack died, and as the legend goes God refused him entry into heaven because of the unsavoury tricks he played. However the Devil would not allow him into Hell either as he had already promised not to claim his soul. The Devil sent Jack back to the living, but he was only to appear at night with a piece of burning coal to light his way. The story goes that Jack put the coal into a carved out turnip and has roamed the Earth with it ever since. The Irish referred to this ghostly figure as 'Jack of the Lantern'', but as the centuries passed it was eventually shortened to Jack O'Lantern'. In the Celtic lands of Ireland and Scotland it became tradition for people to make their own versions of Jack’s lanterns by carving scary faces into turnips or potatoes. However, England it became commonplace to use large beets instead. These would be placed in windows or by their doors to frighten away Stingy Jack and other wandering evil spirits. 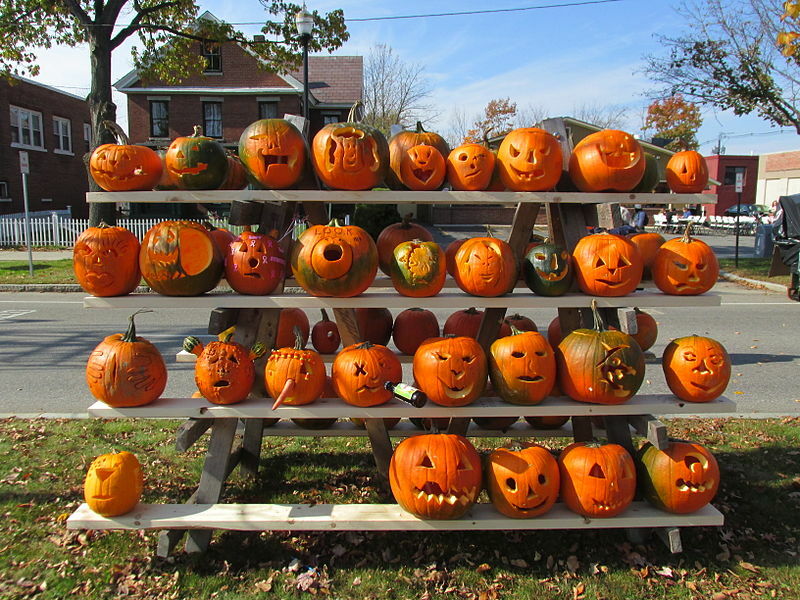 As immigrants from these countries settles in area of the United States, they brought the 'Jack O'Lantern' tradition with them. Together with the popularity for eating the native pumpkin they soon found that it make the perfect Jack O’Lanterns. From that time the tradition of a carved pumpkin over the Halloween period has remained ever since.